I find dynamic general equilibrium models — from the Ramsey–Cass–Koopmans versions to the Lucas–Chari–Prescott-Kydland or, if you prefer, to the Woodford–Mankiw versions — very thought-provoking; helpful to one’s critical understanding of social life. They are not necessarily accurate in their “predictions” in a numerical or even algebraic-sign sense, but asking them to bear those fruits is expecting too much from them. They are rather simple logical edifices that generate straightforward conclusions that can, then, be contrasted with data, observations drawn from the world as is, and thus help stimulate our thinking and inform our actions. Of course, both the conclusions of the models and the statistical manipulation of the data are as good as the postulates on which they are based. (To manipulate data statistically, one always imposes on them some “structure,” i.e. assume certain properties of the “data-generating mechanism” when, in fact, such “mechanism” is only known to us through the manipulation of data!) These postulates are always dictated by our prejudices and, in the last analysis, by the pressure of vested interests. Furthermore, there’s a sense in which these postulates are inherently self contradictory. More on this below. Playing mentally (or with pen on paper, or aided by computers) with alternative postulates to see how the models’ predictions flutter (or how the models fail altogether to yield straightforward conclusions) is the closest the economic discipline gets to the “controlled” experimentation practiced in the physical and biological sciences. Making the models stochastic adds an additional bell-and-whistle that, if kept well contained, expands the array of what-if scenarios illuminated by the model. The cost of that is, of course, added complexity. But so far so good. Now, why do I say that these models are inherently self contradictory? Typically, the internal logical contradictions in these models arise from the self-referential character of social life. One of the classical expositions of these contradictions is, of course, Keynes’ General Theory, chapter 12. A lucid and updated rendition can be read in Duncan Foley’s introductory chapter to Peter Albin’s Barriers and Bounds to Rationality. Clearly, the self-referential nature of social life places absolute limits to the stochastic or statistical addenda of dynamic general equilibrium models. The stochastic element, if the model is to converge to a general equilibrium, needs to be stipulated mildly, in terms of “stationary processes.” Multivariate stationary processes are those that maintain a certain qualitative stability over time, as captured by the “moments” of the multivariate (or joint) probability distributions. At certain points, social life experiences drastic qualitative changes that betray these assumptions. However, as I argued in my critique to Paul Davidson’s The Keynes Solution, these limits will never keep us from trying to anticipate one another’s moves in social life. Life is a struggle and social life is, well, mainly a class struggle, and we tend to inform our actions with the best knowledge available, even if such knowledge is always contingent. If we push it further, the very idea that one can incorporate inter-temporality or, more simply, “time” (hence the adjective “dynamic” in dynamic general equilibrium) in these models is highly problematic. Time in social life is what is often referred to as “historical time,” i.e. physical or “cosmological” time as experienced by us collectively (and “psychological time” or physical time as experienced by us, individually). If we believe, as I do, that we are just a piece of nature with a few distinctive properties but ultimately subject to nature’s “laws,” then what is true for physical time extends to historical (and psychological) time. For what I understand, physicists (e.g. Stephen Hawking) conceive of physical time as one of the four coordinates of the “curved” space-time “hyper-surface” of the universe. This hyper-surface is curved because the substance of the universe (“energy” or “mass”) is unequally distributed on it. And its curvature shifts as this universal substance moves around it, the “force of gravity” being an outward manifestation of this curvature. The “arrow of time” (from past to present to future, as opposed to in the other direction) results from one of the fundamental laws of motion of this worldly substance about its space-time hyper-surface, namely the “second law of thermodynamics.” As Hawking argues, our bodies (or parts thereof, such as our brains), or its artificial extensions (e.g. computers) embed or store knowledge (“remember the past”) by organizing (or reorganizing) themselves, i.e. by increasing order in a few small parts of the universe, but only at the expense of increasing the disorder or “entropy” in the rest of the universe. Energy must be spent to increase the order or organization of our brains (or of our computers, since we must deliberately change and maintain their physical states). Since energy-in has to equal energy-out (“first law of thermodynamics” or “conservation law”) and the knowledge embedded in the higher organization of our bodies, brains, or computers embodies only part of such energy (as “potential energy”), the rest of the incoming energy dissipates in the rest of the universe as non-recyclable heat. The probability of upcoming disorder overwhelms the probability of future order. It is this thermodynamic arrow that determines the way in which we perceive, individually and collectively, psychologically and historically, the passage of time. Our brains (and computers) being physical, are subject to these thermodynamic constraints. Hence, we will never be able to “remember” (or know) the future; except by reference to the past. Perfect foresight requires the reversal of the second law of thermodynamics. Time for us (the way we experience physical time, individually and collectively) is indissociable from our partial ignorance about causes and effects in the physical and social world. Time and uncertainty are one and the same problem for us. So what? — one may quip. Isn’t everything in the world interconnected with everything else? Yet, don’t we continue to think by abstraction, i.e. by imagining a world when one thing can change at a time giving us the opportunity to see what difference that single change makes on other things? 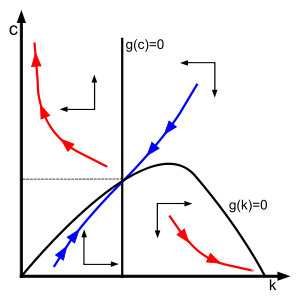 What is wrong with stripping “pure” time from the “pure” uncertainty element, or vice versa? Indeed. But then we must recognize the limits that this artificial dissection of what is always glued together imposes on our understanding. The point is not to go nihilistic and conclude that human cognition is impossible. Yanis Varoufakis refers to theoretical manifestations of this contradiction in economics as the “radical indeterminacy” of the discipline, a condition that damns the whole field. I do not go that far. Regardless of whether some knowledge is practically worse than no knowledge (and I do not think we know why this would or would not be the case), the quest for knowledge — which is to say, the quest to appropriate the world, social structures included, and conform it to human design — is intrinsic to our humanity (cf. the motto of this blog!). The point is to undertake action with awareness of the limitations of our cognition. Here’s another specific example of the internal logical contradictions of these models: Invariably, the models postulate exclusive or private ownership over wealth as part of their institutional framework. However, “excludability” (the degree of effective ownership over wealth, the ability to choose how such wealth is to be used) is an endogenous outcome. The equilibrium of these models is a self-fulfilling prophecy when all the agents of the model assume that exclusive ownership is an absolute given (and some other conditions ensue). By postulating private ownership as given, the modellers are presuming that private ownership is some fact of nature existing in parallel to the mechanism that equilibrates the model. Instead, at each point or period of time, it is a social outcome. Private ownership is itself an aspect of the equilibrium: an outcome to be produced precisely by that equilibrating mechanism. A premise of virtually everything I studied in graduate school, and virtually everything I taught as a professor of macroeconomics for some years, was that a coherent model had an equilibrium, and that if conditions changed, it would move to a new equilibrium. Surely the events of the last few years call that proposition into question. If the world had unfolded forward from 2007 with no policy actions taken, no lending of last resort, no expansionary monetary policy, no expansionary fiscal policy, I would suggest to you that there is a real possibility that the right approximation would have been an unbounded downward spiral, a possibility ruled out in any textbook model or almost any model published in a journal in the last several decades. Welcome to the club, Larry! Social structures — both “organisms” like markets or spontaneous mobs and “organizations” like states or firms — are as fragile or as robust as people deem them to be, people taking actions under the constraints imposed by nature and their own social interactions. So — yes — social structures can disintegrate with little prior notice. Which leads me to my reflection on the so-called “self-correcting mechanism” of markets. Some economists deny adamantly that markets have a “self-correcting mechanism.” I guess it depends on what you mean by “markets.” One can interpret Larry Summers’ remarks above as saying something like that. But let me go really basic here and ask the question of: What exactly is what would make or motivate people in a market to adjust their actions in response to changes in the “economic environment” (stuff like “technology,” “preferences,” “wealth redistributive” shocks, or rather “expectations” thereof) so that some price emerges to “clear the market”? I believe that the answer boils down to the assumption of “rationality,” in whichever sense we may wish to define it. It is the purposive character of human actions (which is the distinctive feature of human activity vis-a-vis the rest of nature) that leads to the realization — at some point — that the old actions “demanded” and “supplied” cannot be collectively reconciled with the new “economic environment.” In the market setting, this is a narrow, individualistic kind of rationality that may — and often does — lead to massive collective irrationality. In the frictionless world of the typical model, the adjustments happen at once, as soon as the “economic environment” shifts, and their reverberations across the rest of the economy are set up in such a way that some steady state is restored. In this ideal world, the adjustments stay local and their propagated effects die down with time and distance. This is by design: Without convergence to some steady state, the model collapses (i.e. it stops being useful). Because who is interested in the multiple possible ways in which a society can break down? Now, with sticky prices (or “informational imperfections,” etc. etc. ), adjustment processes may become discontinuous, the imbalances in the model may accumulate at the risk of abrupt adjustments, nonlinear effects, etc. Arguments like this may justify calling for some policy intervention. Without the state, the “self-correcting mechanism” of markets asserts itself, but not gently. The self correction becomes a serious snap, a disruptive and sudden explosion, appearing to the agents of the economy — to use Marx’s graphic metaphor — as the law of gravity appears to people when the roof collapses over their heads. Massively disruptive adjustments caused by the “self-correcting mechanism” of markets is precisely what we call “crises.” The problem is not that markets (i.e. the social structures that people trading their exclusively owned stuff establish with one another), in general, fail to rebalance social life in some way, but rather that the social cost of such rebalancing, the extent to which they may fray and unravel the existing social structures, becomes too steep to contemplate for the enlightened layers of the ruling class (if they even exist). As I also suggest in my critical review of Paul Davidson’s book, the pressure for policy interventions is or should be viewed as a “self-correcting mechanism.” It is a non-market, or extra-economic mechanism, but “self-correcting” nonetheless. In other words: A severe crisis forces people to demand and expect that the “self-correcting mechanism” of markets be replaced with the “self-correcting mechanism” of the state. But what if the crisis metastasizes and becomes political in the most radical sense? What if the very premises of political life, of the state structure, become the obstacle to the restoration of continuity in social life? What if the very political constitution of society, the state as it exists, gets in the way of restoring order and continuity in the interaction among people? This obviously depends on how people move politically, what kind of aspirations and demands they are capable of articulating and fighting for. But this is when the social “self-correcting mechanism” goes truly primal. It is the time when revolutions become possible and even necessary. In this light, the “self-correcting mechanism” of markets is a rather superficial expression of human rationality, a narrow rationality that takes much for granted. The purposeful nature of human activity, the fact that we humans — in contrast with the rest of nature — tend to problematize the world (the human problem par excellence being going from the “world as is” to the “world as we need it to be” or “as we design it to be”), the fact that we exercise “Will” (Hegel) or approach the world as “producers” or “laborers” (Marx), the fact that our purposeful activity, our labor, only exists socially, in association or cooperation, is what underlies in the last analysis any “self-correcting mechanism” — i.e. our impulse to keep society from breaking down altogether and regressing to animality, our impulse to restore civilized life, to reorganize our social life in ways that fit our highest (historically-evolved) values and aspirations. The political “self-correcting mechanism” fails, the radical premises of the social order get questioned, and the self-correcting mechanism” of revolutions become necessary. Once the internal connections are revealed, all the theoretical belief in the eternal necessity of the existing conditions collapses, even before the collapse takes place in practice.